Here is a draft catalogue of the Stella's art. It is not complete. She painted over 500 portrait miniatures, many oil portraits, charcoal, pastel and other drawings. It is pieced together by studying old documents, photographs, letters and press coverage. I have shown images and prints of some of Stella's work and hope to gradually add more. I also hope to add further information about individual works, creating a catalogue raisonné. Where possible I have indicated the year painted or, at least, the "year or earlier" painted. At the end is a list of works where I have not yet got a good fix on the date. By giving names, places and dates where possible I hope some people may recognize themselves or relatives, especially if they are in possession of one of the miniatures. I hope all this will be useful to establish provenance. Please contact me if you have corrections, additions or any interesting facts about individual works. Pencil Sketch for Stella Marks' first miniature, 1912. Copyright Stella Marks' Es. All rights reserved. Pencil sketch for a miniature by Stella Marks of Mrs. Dr Pearsall, London 1912. Copyright Stella Marks' Estate all rights reserved. Marjorie Williamson / A Portrait Study (miniature). An Actress. Painted before her marriage and daughter of the late Australian/American theatre impresario, James Williamson. Exhibited (as 'A Portrait Study') in the Pennsylvania Academy of Fine Arts November to December 1916 14th Annual Philadelphia Water Color Exhibition and 15th Annual Exhibition of Miniatures where a b/w image was featured in the catalogue. 'A Portrait Study' is noted in the October 1916 edition of The International Studio. Shown in Stella's February 1926 Exhibition at The New Gallery, Melbourne. [source: press cuttings and catalogues]. Featured in 17 January 1926 The Sun. In 1936 it was shown at The Royal Academy and "hung in a prominent place" (source: 8 December 1937 The Sun). After a Self-Portrait by Stella Marks circa 1915. Copyright Stella Marks All rights Reserved. 'The Model - unfinished Study' 1915. After a miniature by Stella Marks. Copyright the artist all rights reserved. Mrs. Fred T. Moran (miniature). Noted in 10 December 1916 Detroit Free Press that Stella was in Detroit to paint Mrs. Fred T. Moran. Noted in 1918 Evening Sun article. Mrs. Studebaker Henderson wearing a miniature of Lucius Henderson (miniature/miniature within miniature ). Miss Finucane (miniature). Noted in 1917 Evening Sun article. I assume of Thomas W. Finucane of Rochester. Noted in 5 November 1916 The Rochester Herald. Mrs. Studebaker Henderson, wearing the miniature of Lucius Henderson. After a miniature by Stella Marks. Copyright the artist all rights reserved. Pencil sketch for a miniature by Stella Marks of H.R.H. The Princess Patricia of Connaught, 1916. Copyright Stella Marks all rights reserved. The cellist, Micheal Penha, 1916. After a charcoal drawing by Stella Marks. Copyright all rights reserved. Extreme close-up detail from Stella Mark’s charcoal drawing of the cellist, Micheal Penha, 1916. Copyright all rights reserved. Mrs. Harry Ford (miniature). Noted in 1918 Evening Sun article. Walter Briggs Jr. (miniature). Noted in 1918 Evening Sun article. Lieut. William Warner (miniature). Of the Royal Flying Corp. Noted in 1918 Evening Sun article. Mrs. Belmont Tiffany (miniature). A leading member of the newly established American Red Cross. Noted in 1918 Evening Sun article. Noted in 23 March 1918 edition of The Pittsburgh Sun as being exhibited at Grogans, along with others by Stella "all characterised by drawing and freedom of handling not often seen in miniatures." Mrs. Emmet Kelley (miniature). Of Toronto. Noted in 1918 Evening Sun article. Georgia Kelschner (miniature). The daughter of W.W. Kelschner (miniature). Noted in 1918 Evening Sun article. Daniel C. Jackling (miniature). Of San Francisco (miniature). Noted in 1918 Evening Sun article. Mrs. Daniel C. Jackling (miniature). Of San Francisco (miniature). Noted in 1918 Evening Sun article. Also? Mr. Daniel C. Jackling noted in 10 November 1936 Buenos Aires Herald. Monty - the day he went to war (oils). This was painted hastily in 45 minutes prior to Monty leaving to join the Canadian RFC and one month after his elder brother, also in the RFC, was killed in action. Mrs. Lyman Rhoades (miniature). USA. Mrs Reilly (miniature). Of Canada. Barbara Buehler (miniature). The daughter of Dr. Hubert Buehler of Lakeville Conn. Noted in 1918 Evening Sun article. Noted in 23 March 1918 edition of The Pittsburgh Sun as ('Barabara portrait of a child' - I assume Buehler?] being exhibited at Grogans, along with others by Stella "all characterised by drawing and freedom of handling not often seen in miniatures." Pencil sketch for a miniature of Mrs. Belmont Tiffany, circa 1917. Copyright Stella Marks all rights reserved. Barbara Buehler, after a miniature by Stella Marks 1917. Copyright all rights reserved. After a miniature by Stella Marks of Nadine Reilly 1917, wife of Sidney Reilly. Copyright Stella Marks all rights reserved. Mischa Levitski (miniature). Noted in 1918 Evening Sun article. Mary Whitman (miniature). New York. Daughter of Malcolm Whitman. Miss Doris Kenyan (miniature). Exhibited at the Annual Water Color And Miniature Exhibition at The Pennsylvania Academy of Fine Arts 1921. Exhibited at the Royal Academy in 1936. Mrs. Madge Carr Cook (miniature). Painted in New York. Exhibited in February Melbourne 1926. Actress who premièred Mrs. Wiggs of the Cabbage Patch on Broadway (sources: press cuttings and catalogues). She was the mother of actress Eleanor Robson, later Mrs August Belmont, who was also painted by Stella (source 10 November 1936 Buenos Aires Herald). Cadet Samuel Lewis R.E. Print After a miniature by Stella Marks. Mrs. Warburton (miniature). Painted in New York. (Also one dated 1921?). Estelle Winwood (miniature). Painted in New York. Theater and film actress in the West End, Broadway and Hollywood. Featured in Arts and Decoration article April 1922. Mrs. Edward's children (miniature). Painted in Japan. Portrait miniature of General Amos Samuel Kimball painted posthumously by Stella Marks. Circa 1920. Mrs. Horace K. Horner (miniature) source: Annual Water Color And Miniature Exhibition Catalogue - The Pennsylvania Academy of Fine Arts 1921. Image featured in the catalogue. Pat aged 1 (miniature). Stella's daughter. After a miniature ofMiss. C. Youngs by Stella Marks 1922. Mr. Justice McKenna (miniature). Of the Supreme Court of the USA. Shown in Stella's February 1926 Exhibition at The New Gallery, Melbourne. Exhibited at the Royal Academy 193?. 25 February 1938 purchased for the National Gallery of Melbourne by the Felton Bequest Committee. [sources: The National Gallery of Victoria, 26 February 1938 The Argus and The Age and catalogues]. It was also featured in 9 December 1937 The Sun. Click here to go to The National Gallery of Victoria image. Once there click on the image to show details in magnification. Pat aged 6 (miniature). Stella's daughter. Pat aged 8 (miniature). Stella's daughter. Pat aged 9 (miniature). Stella's daughter. Pat aged 10 (miniature). Stella's daughter. Pat aged 11 (miniature). Stella's daughter. Pat aged 12 (miniature). Stella's daughter. Elena Miramova (drawing). Featured on the program cover of New York's The Forrest Theatre 1934 production of Theadora, The Quean. Pat aged 13 (miniatures x 2*). Stella's daughter. Featured in 10 November 1936, Buenos Aires Herald, 9 December 1937 The Sun and 22 January 1938 The Age. 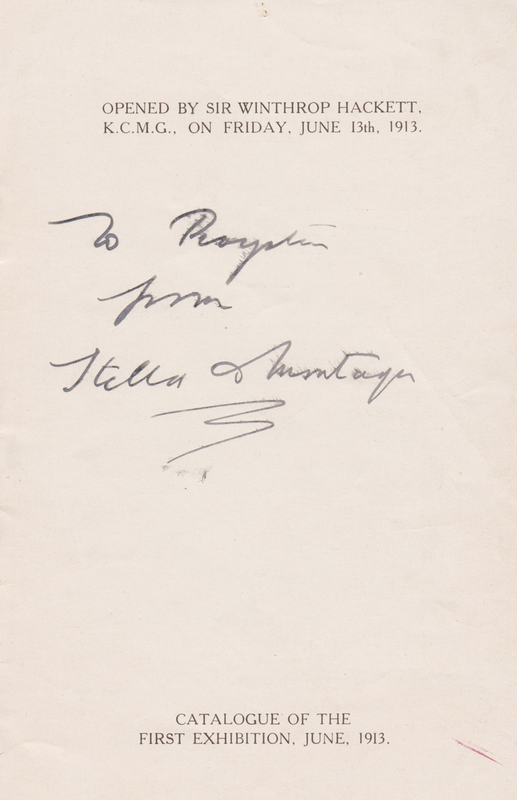 Exhibited in 1937 at the Royal Miniature Society 22 Bond Street (source: Stella's note on back of photograph). Pat aged 14 (miniature). Stella's daughter. Mrs. August Belmont (miniature). The actress Eleanor Robson who married August Belmont Jr. Noted in 10 November 1936 Buenos Aires Herald. Members of the Crocker family (miniature(s)). of San Francisco. Noted in 10 November 1936 Buenos Aires Herald. Leslie Banks (sketch). Noted in 10 November 1936 Buenos Aires Herald. Mrs. Douglas Fairbanks Sr. (sketch). Noted in 10 November 1936 Buenos Aires Herald. Mrs. Arthur W. Kelly (miniature). The Wife of the Vice President of United Artists. Noted in 10 November 1936 Buenos Aires Herald. Pat aged 15 (miniature). Stella's daughter. Pat aged 16 (miniature). Stella's daughter. Pat aged 16 (charcoal). Stella's daughter. Pat aged 16 (oils). Stella's daughter. Pat aged 17 (miniature). Stella's daughter. Self-portrait (oils). Now in Anthony Pettifer's private collection of Stella's work. Sonia Harrison (miniature). Stella's niece aged two. Painted in London for Kay and Heather Harrison, just before she was evacuated to America. Sir Winston Churchill (miniature not from live sittings). Portrait Miniature by Stella Marks of Miss Betty Ince of Melbourne. first ever theft from the royal Scottish academy. Roses (still life in oils) featured on the front cover of July's Woman's Journal. Mary Churchill (oil portrait) featured on the front cover of October's Woman's Journal. Mrs. H.T. Kalmus (miniature). Shown at Burlington House. Mrs. Ian Cleland (miniature) daughter-in-law of Jean Cleland (friend and neighborough at Hengrove. Shown at Burlington House. María del Carmen Franco y Polo, the Marquise of Villaverde (miniature). Spain. Franco's daughter. Sir Godfrey Tearle (miniature) actor. Worn by Joan Fontaine in the production of 'Decameron Nights'. Maureen O'Hara (miniature) actress and friend. The miniature was sold at Sotheby's in 2007 along with items of Maureen O'Hara's jewelry. H.R.H. The Princess Anne version 1 (oils). Woman's Journal commission. Front Cover of Woman's Journal August 1953. Colour feature 9 November 1953 Woman. H.R.H. The Princess Anne version 2 (oils). Front cover of 12 September 1953 Woman's Pictorial. Maureen O’Hara 1953. After a portrait miniature by Stella Marks. Copyright the artist all rights reserved. Michael Pettifer (oil portrait). Pat's eldest son. It was exhibited at the Royal Portrait Society in 1958. Baron Felix von Vittinghoff-Schell (charcoal). Given by Stella to his wife Aileen. Princess Olga Andreevna Romanoff (miniature) daughter of Prince Andrei Alexandrovich of Russia (son of Grand Duchess Xenia Alexandrovna, sister of Tsar Nicholas II). Painted at Norton Court, Kent. Note: this miniature was stolen in 1990 or 1991 from 'Provender', the Romanoff's home in Kent. Should anyone recognise it from the black & white photograph shown here or discover it please get in touch with me by going to the contact page so I can return it. H.R.H. The Prince Edward (miniature). Painted in October at Buckingham Palace. Royal commission. Christopher Neville (miniature). Son of Lord Rupert Neville. Henrietta Neville (miniature). Daughter of Lord Rupert Neville. Lady Romayne Bockstoce and two others of her family (miniatures?) [source: letter to Stella 16 January 1972 from Lady Romayne Bockstoce and on 2 January 1972 from Mrs. Clifton M. Bockstoce (Betty) of 1160 Prospect Avenue Hartford 5, Connecticut, USA. They mentions 2 portraits, the other is possibly of "Betty", and a letter to Stella from Clifton Bockstoce on 13 November ]. H.R.H. The Princess Anne aged 21 (miniature). Painted by Stella for herself. The Earl of St Andrews (miniature). Son of the Duke and Duchess of Kent. The Lady Helen Windsor (miniature). Daughter of the Duke and Duchess of Kent. Anne Maureen Pettifer (miniature). Stella's granddaughter. Painted at Norton Court. H.M. Queen Elizabeth II (miniature x 2). Painted at Buckingham Palace. Second version painted by Stella for herself and exhibited at The Royal Miniature Society in 1977. Ignacio Fuster (pencil sketch for a miniature). Director of Vickers Armstrong in Spain? according to a note by Stella's daughter Pat. A Spanish Cardinal (miniatures x 2) Possibly related to Ignacio Fuster since Stella noted in her album the name Ignacio Fuster. Kay Harrison (oil). Monty's younger brother. Lady Korda (sketch for a miniature and a miniature). 3rd wife of Sir Alexander Korda. 'Betty' (miniature). Née Elizabeth Latourette, Betty was American and married Stella's brother, Samuel Lewis. Later she remarried and became Betty Craig. Joan Craig Birdsall (miniature). The daughter of 'Betty'. Rae Harris (miniature). The wife of Monty's cousin Cliff Harris. Sir Colin Coote (oils). Editor of the Daily Telegraph. Jerry Cornes (oils). Headmaster of West Down school. Donated to the school by Mr and Mrs Pettifer. Silvia, Lady Ashley (sketch for a miniature, probably also a miniature) wife of Anthony Ashley-Cooper and later of Douglas Fairbanks Sr.
Vera Bleck (miniature). Sister of Silvia Ashley. Wife of film producer, Basil Bleck. Exhibited at the Royal Miniature Society in 1977. Raymond Segrave (miniature). He died aged 5 and Stella painted him from memory for his mother Anne Segrave. Elisa Segrave (miniature sketch), Elisa is an author and wrote the book "The Girl From Station X - My Mother's Unknown Life" about Anne Segrove. Ben Goet?y (miniature sketch so possible also a miniature). I cannot fully read the surname. Mrs Ben Goet?y (miniature sketch so possible also a miniature). I cannot fully read the surname. Dr Marmonston? (miniature sketch so possible also a miniature). I cannot fully read the surname. Sir Connop Guthrie (miniature). Board member of London Films Productions and Montagu Marks' key contact and ally with Prudential Insurance. Jean Cleland (drawing) Neighbor at Hengrove. Michael Pettifer (various other miniatures, oils, sketches). Stella's grandson. One miniature of Micheal Pettifer exhibited at the Royal Miniatire Society in 1977. Annie Dixon (various miniatures, oils, sketches). Stella's granddaughter. '3rd Miniature of Miss Anne Pettifer' exhibited at the Royal Miniature Society in 1977. Pencil sketch for a portrait miniature of Sir Alexander Korda by Stella Marks. Copyright Stella Marks all rights reserved. a Miniature by Stella Marks of her sister-in-law 'Betty', Née Elizabeth Latourette. Copyright all rights reserved. Thanks to Joan Craig Birdsall for the Photograph. a Miniature by Stella Marks of .Joan Craig Birdsall Copyright all rights reserved. Thanks to Joan Craig Birdsall for the Photograph. Rough Sketchs for miniatures by Stella Marks of Raymond and Elisa Segrave.